Can these upgrade? I've gotten 3 through missions and no luck with it doing so. this actually compares to heroic trinkets quite well. 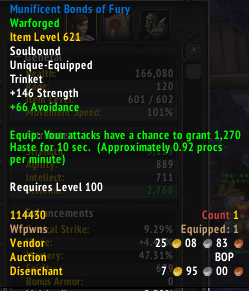 I found this today in a Rare Trinket drop from a Garrison Mission, it's Item Level 621 and Warforged and dropped with Avoidance which is one of three possible drops (Leech, Movement Speed or Avoidance). I would prefer Leech or Movement Speed but it's better than all other drops I have received thus far for trinkets. don't care much for the haste as an arms warrior, but the strength sure is nice. mine also came with a prismatic socket. Any1 know the internal cooldown for this trinket?